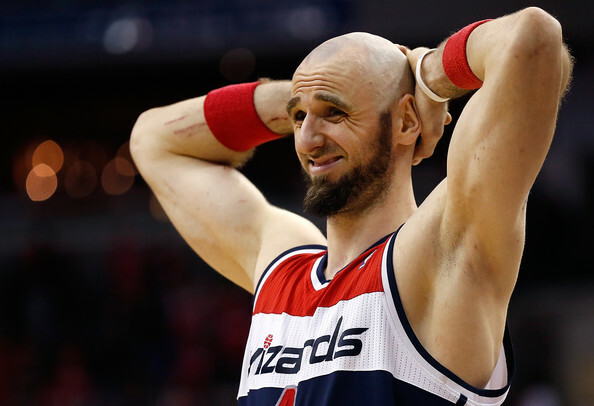 Marcin Gortat honored to hear he led the Wizards in PPA last season. In the relentless quest to keep First Draft on the vanguard of current events, I’m going to post my final regular season grades for the Washington Wizards. Psst — Hey dummy, the season ended in April. The Wizards went to the playoffs, beat the Bulls in round one and then got smacked by the Pacers. Yeah, but this is incredibly timely in geologic terms. So…umm…anyway, I’ve been away awhile. It’s been a crazy summer. To go full-on Dad-Brag mode, my son Joe became the first high schooler to reach the semifinals of two international euphonium competitions this year. He made the finals in one — along with four adults who (at minimum) had masters degrees in euphonium performance. While he’d never brag about it, I will. Happily. So how has he celebrated the success? More practice, of course. Back to the topic of the day — the Wizards. The season has already been hashed and rehashed ad nauseum by now, so I won’t go too deep in the weeds. I’ve gotten a few requests for the final Player Production Average (PPA) numbers, which are below. I’ll have playoff numbers up soon, followed by results from my Statistical Doppelganger Machine, and then maybe even some observations about this year’s draft from Ye Olde Draft Analyzer (YODA). PPA is an overall rating metric I developed that credits players for things they do that help a team win, and debits them for things that don’t. It’s a per-minute stat that’s pace-neutral, accounts for defense, and includes a “degree of difficulty” factor based on the level of competition a player faces while on the floor. In PPA, 100 = average, higher is better, and 45 = replacement level. I’ll get more into this when I do similarity scores, but it’s worth mentioning that Wall’s PPA last season (2012-13) was the same 139. He accumulated accolades this season, but his actual production wasn’t at an elite level. I’d hoped (and expected) Wall’s production to be in the 160s range, and I’m a little concerned that it was flat (on a per minute basis). Still, aspects of his game improved (especially three-point shooting), and his ability to play nearly 3,000 total minutes was important for a team that bungled the backup PG spot so badly. Also in the “cause for concern” bucket: Nenê’s production. His on/off numbers remained good (at least on defense), but my analysis suggests he wasn’t necessarily the cause. His overall production was about league average, which means he was below average for a starter (average for starters usually lands between 125 and 130). I’d hoped for a bit bigger jump from Beal, but his final PPA for the season wasn’t bad for a guy who was still among the league’s youngest players. I continue to think he’s going to have a long and productive career with multiple All-Star appearances. Preserve cap space for 2016. With that in mind, they sat out the first round of the draft (because they’d traded the pick for Gortat), and (predictably) sold their 2nd round pick for cash. They re-signed Gortat to a market deal for a solid big man. I wasn’t thrilled with the fifth year, but it was exactly in line with what I anticipated. Departing were (in order of importance): Ariza, Booker, Singleton, and Harrington. Incoming replacements were: Paul Pierce (PPA: 131), Kris Humphries (132), and DeJuan Blair (97). They also inexplicably retained the services of Seraphin for another year. The Pierce for Ariza swap is a step back for the Wizards. Pierce is still a pretty good player (and his production was better in the 2nd half of the season), but he’ll be 37 when the season starts, which is an age where production sometimes just falls off a cliff. Plus, older players tend to be injured more frequently, and the injuries can linger. It’s just a fact that older players do two things reliably: get worse and get hurt. Washington’s need for contributions from Otto Porter, last year’s 1st round pick, are magnified by Ariza’s departure, Pierce’s age, and Webster’s back surgery. The acquisitions of Humphries and Blair are excellent moves. Both come at bargain prices, and both are productive players. That duo should give the team sufficient frontcourt depth to weather Nenê’s fragility, and enough quality that they won’t miss Booker. Overall, it was a good offseason for the team. The East doesn’t appear to be much stronger, and the Wizards could be a top four seed if they get significant improvements from any combination of Wall, Beal and Porter.